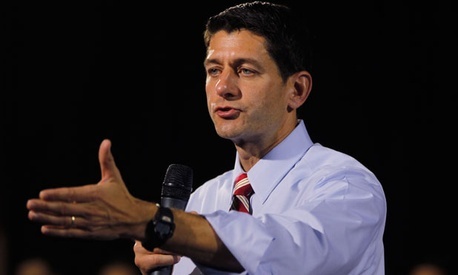 WAUKESHA, Wis. – In spite of his own seven terms in Congress -- and current pursuit of an eighth -- Paul Ryan told a voter here on Monday that he would favor a constitutional amendment limiting the number of years that members of the House and Senate can hold their positions. The man at the town hall who asked if he favored term limits gave an example: two six-year terms for senators and six two-year terms for members of the House of Representatives, meaning no one would serve in Congress for more than 12 years. Ryan began his response by saying that he cosponsored legislation to that end when he entered Congress, but a CBS News/National Journal examination of bills to which Ryan added his name did not find any relating to term limits. During his initial run for the House in 1998, Ryan publicly backed the idea, according to The Huffington Post. "We need to return power to the people by taking it away from a growing political class," his campaign website stated at the time. "One way to do this is by passing a constitutional amendment that will limit the number of terms a congressman or Senator can serve. We have limited the number of terms the president can serve. The same should be done for legislators." But Ryan refused to sign a three-term limit pledge because he thought it should have the backing of all members of Congress, The Huffington Post said. He also did not specify at the time what he thought the cap should be on reelections. His position puts him in line with Mitt Romney’s, who endorsed term limits during a town hall in Hopkinton, N.H., last October. “Wouldn't it be wonderful if we had people who'd go to Washington for some period of time and then go home and get a real job again in the real economy? That would be a wonderful thing,” he said.